Off Broad Street Players (OBSP) will participate in this year’s First Night celebration at 7:30pm at the Claremont Savings Bank Community Center. Their show, “A Little Bit of This, A Little Bit of That,” is a mix of theater, storytelling and song to entertain children and adults of all ages. Cast members are Harold Hall, Scott Magnuson, Trudee Rice, Bob Tourangeau, Phil Turner, Sharon Wood, Steve Wood, and Miss Maddie Jarvis & friends. 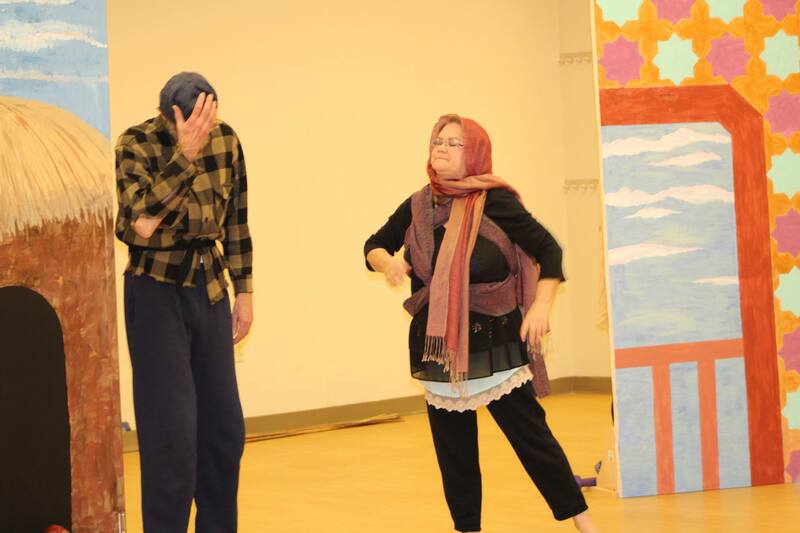 They will bring to life two traditional folktales, one Polish and one French, and two familiar stories told in song. Since 1985, OBSP has entertained local audiences with Broadway musicals, classic dramas, hilarious dinner theater shows, cemetery walks in partnership with the Claremont Historical Society, and nostalgic old-time radio shows. They have participated in Claremont’s First Night celebrations since the 90s. Don’t miss their last show of 2017 on New Year’s Eve at the CSBCC! Photo: Steve Wood and Trudee Rice are pictured performing at OBSP’s First Night show at the Claremont Savings Bank Community Center in 2015.